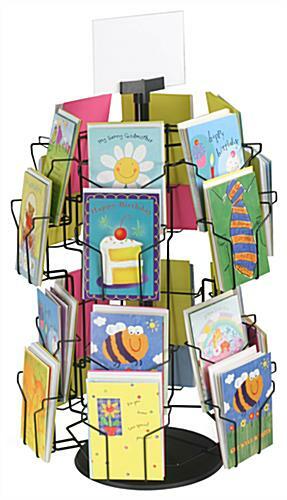 These Greeting Card Stands Feature 24 Pockets for Merchandise. In-Stock and Ready to Ship, Call by 1:00 p.m. for Same-Day Shipping! These Commercial Products Boost Sales in Your Storefront. Compact design is great for countertops. 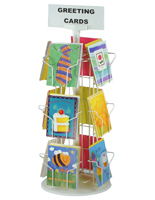 These greeting card stands that have a spinner are easy to maneuver. Typically, these commercial products are spotted at convenience stores, gift shops, book stores, and all manner of retail venues. These wire shelving units have an additional clip for top mounting of a message describing the genre of the merchandise being housed. 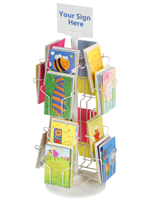 These greeting card stands that are wire shelving plus signage are customizable by the buyer in terms of what goes in the sign holder. 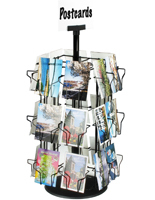 Place your standard 5"w x 7"h cards in these wire products. 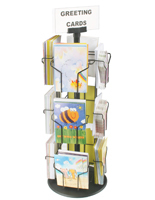 These greeting card stands, commercial wire shelving, will fit 24 different pieces of merchandise. These products are divided into (6) sides with (4) pockets each. Use this wire rack shelving to encourage last-minute purchases. Are patrons buying gifts? Make sure to set wire shelving full of cards at eye level and they won't forget to buy them! 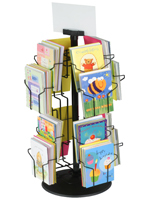 These greeting card stands, such as wire rack shelving, are manufactured out of steel wire and finished in black powder-coated gloss. These displays not only look great when showcasing your merchandise, but they spin around evenly on a round plastic base. 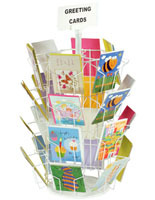 These greeting card stands, wire rack shelving will arrive at your doorstep disassembled, but they can be assembled in just minutes with no tools! 18.0" x 29.0" x 11.0"